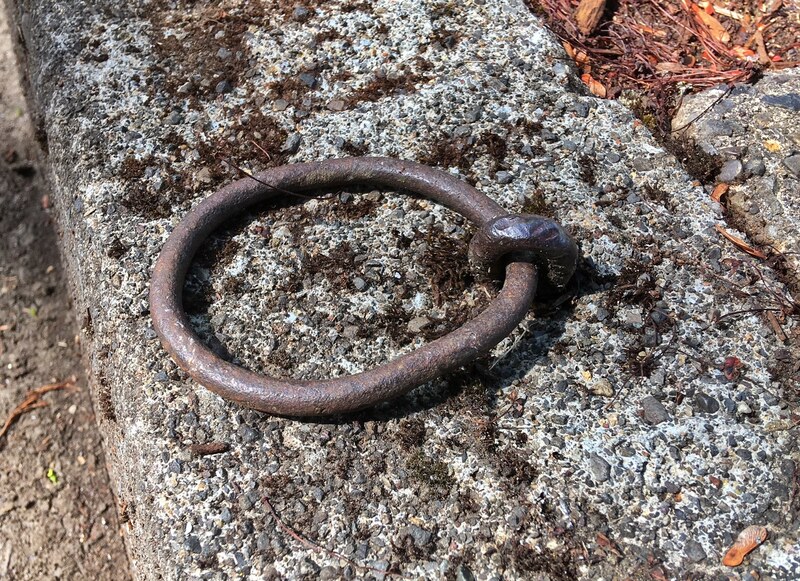 You’ve probably seen those old iron rings tethering toy horses to curbs across Portland’s older neighborhoods, a kind of whimsical tip of the hat to our pre-automobile past. But that old hardware rusting on the curb in front of your house is more than just a quaint antiquity: it had an important job to do back in the day. Many eastside neighborhoods like ours were conceived and built when horses and wagons ruled the streets. In the early 1900s, as Portland was expanding and our neighborhoods were the newly minted suburbs, cars were an unproven, mostly unavailable commodity. In 1905 there were only 218 cars registered in the entire state of Oregon. People got around on foot, horseback and by horse and wagon, but mostly our predecessors here in eastside neighborhoods got around by streetcar. And mostly, neighbors did not keep a horse and wagon at home. So, what’s with all the hitching rings embedded in our curbs? Every commodity and supply that came to your house in those days was delivered by horse and wagon: firewood, coal, ice, groceries, dry goods, laundry, building materials, parcel post packages. A page of classified ads in The Oregonian from 1900-1910 looks like the land of opportunity for horse-wagon delivery teams and people with strong backs. If you had a horse and wagon, you had a job. In 1907 Portland City Council passed an ordinance requiring that new curbs in front of houses have “ring bolts” installed every 25 feet so that delivery vehicles could be securely tied down to protect pedestrians and other wagons using the street. Horse tethering rings weren’t quaint. They were the law. Many delivery drivers also carried a heavy weight attached to a strap they would place out on the ground—kind of like an anchor—to prevent the horse and wagon from moving around when the deliveryman hopped out and ran up the steps. 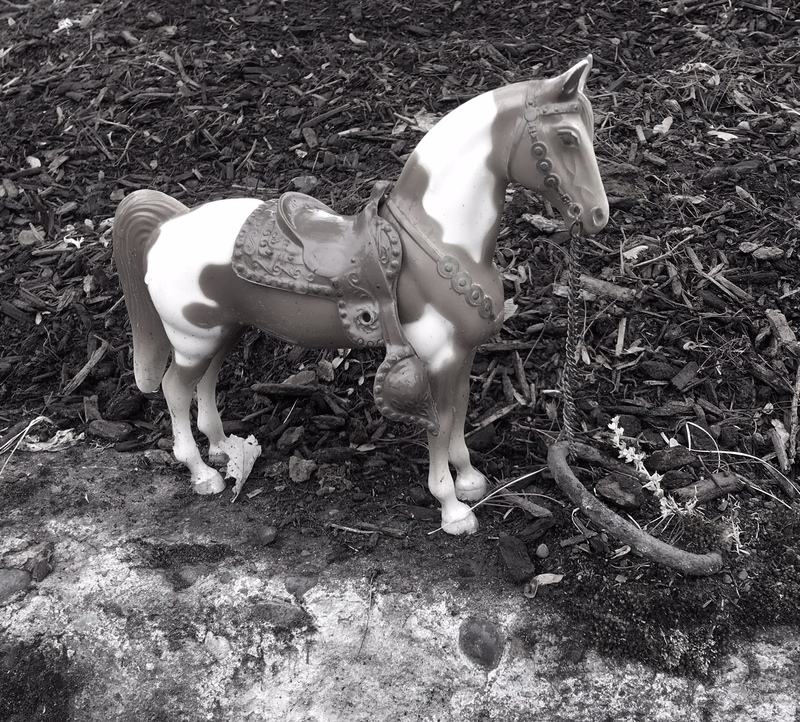 Horse tethering weight. 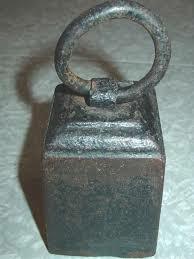 These typically weighed 25 pounds and were attached to a wagon by a leather strap. The driver placed these out on the ground when away from the wagon. By the late 1920s, the automobile (and delivery truck) had almost completely replaced the horse and wagon. Interestingly, streetcar ridership also began to drop off in the late 1920s as more people bought cars and drove where they wanted to go—unleashing a raft of other problems—leading to the demise of Portland’s streetcar system by the late 1940s. But we digress. Editorial response to the proposed ordinance was immediate, sarcastic, nostalgic. The next day, this unsigned piece appeared on the editorial page, bearing the distinctive style and cadence of editor Ben Hur Lampman, columnist and editorial writer, and eventually Oregon’s poet laureate. City Council declined to take action in 1938, but the topic re-emerged in 1947 on the editorial page rising from what appears to have been a chit-chat between Ben Hur Lampman and his grandson. Kind of wistful, we’d say…evidently a topic close to his heart. Over the years, the city’s Public Works Department adopted an unofficial policy of removing tethering rings. Some were saved, but many were dumped. But in 1978, when the city went to work on a curb in Ladd’s Addition, one unhappy homeowner picked up the phone and called the newspaper. His complaint, and his desire to remember the past, caught the attention of City Commissioner Connie McCready (who went on to become Portland mayor). The ensuing dust-up put horse tethering rings back on the front page of The Oregonian. Who would have thought? From The Oregonian, January 7, 1978. Click to enlarge. 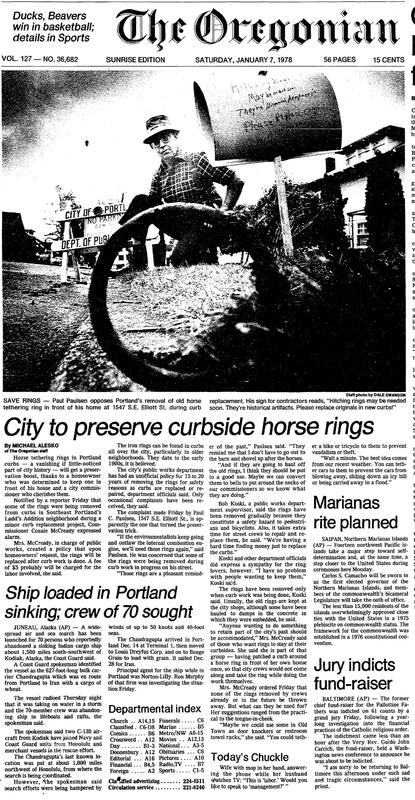 In recent years, the rings have re-entered the public consciousness in the form of the Portland Horse Project, dozens of photos and entries about the tiny horses tethered to curbs all across town (just Google “Portland Horse Rings”), and hundreds of acts of creativity and imagination by horse and history fans across the city. There’s some magic about all of this: the horse rings are here with us in this moment but represent and call to mind a totally different world and time. They ask us to step out of ourselves for a moment to put time and place into perspective, to contemplate both change and steadiness, to acknowledge that what we know about the world today is not necessarily all there is to know. Our old houses do that too.